We are pleased to add a new photograph to our collection of Carlisle Indian School images, thanks to the generosity of James Herster. This photograph depicts a group of 15 student printers in school uniforms circa 1888. This image, along with the names and tribes of those pictured, is now available on our site. We want to thank Mr. Herster for his generosity in donating this image to our collection. In order to make the "recent news & updates" section of our website easy to find, and in order to make the appearance of the site more visually appealing, we have launched an update to the look of the Carlisle Indian Industrial School project homepage. We now have a much shorter introductory text to the project positioned right in the center of the page, with a slideshow of select images on the righthand side. Blog entries providing updates on the project or other useful and interesting tidbits are provided just below the introductory text and slideshow. We hope our users will like these changes to the homepage, and we look forward to rolling out some other new looks and capabilities for the website in the coming weeks. For two weeks in mid-January, a second group of researchers undertook a trip to the National Archives in Washington, DC to continue scanning the student files of those who attended the Carlisle Indian School. Tessa Cicak and Katie Walters, special projects assistants at the Waidner-Spahr Library, and Caitlin Moriarty, Friends of the Library Intern in the College Archives, were able to scan 1,550 more student files comprising more than 16,000 pages of documentation. After adding these to what was completed during last summer's research trip, almost half of the student files have now been scanned. 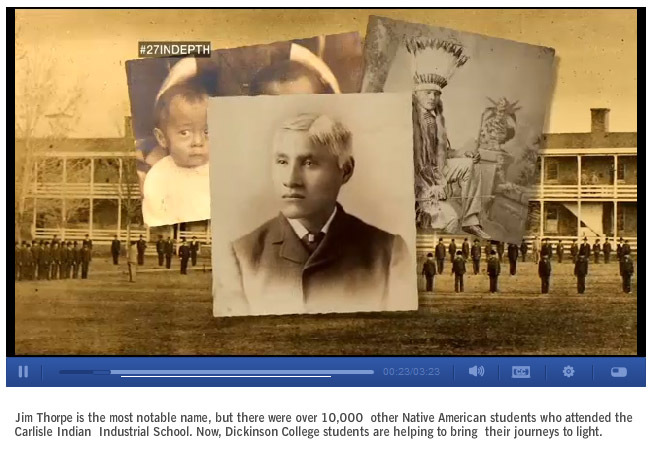 Carlisle Indian School Project Featured in "Indian Country Today"
In an effort to share more information about our ongoing progress with the Carlisle Indian Industrial School project, we have decided to launch a blog that will be available on our homepage. This project began in earnest only 8 months ago, with a team of three making a two-day visit to the U.S. National Archives in Washington, DC to test some workflows with scanners and laptops, and to capture page images from larger ledgers using digital photography. A two-week visit followed in late May and early June, with a research team of four scanning the contents of nearly 2000 student files.